Martin Whitmarsh has made some interesting statements regarding McLaren's performance in Malaysia - Pitpass has the whole interview. Significantly, much of what he says has to do with the relationship between Lewis Hamilton and Heikki Kovalainen, something that interests all of us in view of what happened in 2007. It is true that, at this stage last season, Hamilton and Alonso seemed to be getting along pretty well together, but we should remember that, at the time, Lewis had still to beat Fernando in a race. At Sepang, Heikki beat Lewis fair and square, yet there seems no sign of discontent in the camp so far. And the likelihood is that this will continue, with each driver spurring the other on to greater efforts but without animosity. I do not think that Ferrari's dominance of the race indicates that their car is superior to the McLaren; this was just one of those occasions when Ferrari got everything right (through necessity) and McLaren fouled up. The cars seem fairly evenly matched and we will probably have a season like the last, with first one team then the other getting the upper hand. Which would be good for the championships and more fun for the fans. As Domenicali has pointed out, it is quite possible that BMW will upset things by joining the tussle, however. I have no doubt that he is hoping that this will damage McLaren more than Ferrari since the Italian team appear to have a lead at the moment - but that can change from race to race. BMW's surge towards the front must inevitably undermine the Ferrari/McLaren duopoly and both teams will be muttering in annoyance by the end of the season, I think. 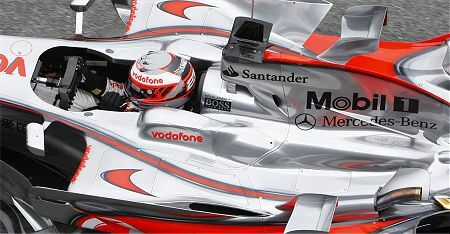 Apart from the performance of the car, McLaren have an excellent reliability record so far, in contrast to Ferrari's. This must make them favorites for the Constructors' title, especially as Felipe Massa has taken to squandering opportunities for points in his quest to beat Kimi Raikkonen. Ferrari was quite smug over the superiority of their driving team last year but I think it will be McLaren that has the last laugh this time around. What both Melbourne and Sepang have proved is that grid position remains massively influential in deciding who wins each race. The front row cars still enjoy the advantage of driving in clean air and avoiding the first corner traffic jam. In Sepang, McLaren experienced what life is like for the midfield teams and they had no special answers to the problem of getting past cars that were marginally slower than theirs. Even the man who wowed us with some amazing overtaking moves last season, Lewis Hamilton, found it impossible to close sufficiently with Mark Webber to make a realistic passing move. So the battle for pole will continue and McLaren may have an advantage in this - they are said to be better over one lap than a full race distance, at least. With the mantle of Top Pit Stop Strategist leaving Ferrari and settling on the unlikely shoulders of Gerhard Berger (if we are to believe his claim that Bourdais' stop in Melbourne was timed to coincide exactly with the emergence of the safety car), there is less chance that races will be decided in the pits. Once again, that increases the emphasis on qualifying and we can expect some intense battles in those hectic ten minutes of Q3. The main thing that struck me from reading what Martin Whitmarsh has said is still to do with the qualifying situation - I put part of the blame on the team as I felt they should have warned the drivers about what was happening around the circuit, however Whitmarsh revealed that the team had indeed warned the drivers. To me that almost makes me speechless as to how stupid Heikki and Lewis were to stay on the racing line! Had they not been told then I could almost appreciate how they could have been caught out, but knowing they were warned means they actively disregarded that information which is crazy. Whitmarsh says Heikki saw Heidfeld in his mirrors and though that moving over may do more harm than good by that point as Nick had probably already decided to go round on the right hand side - and he's right in that statement I think, to swerve may have caused an almighty accident. But having said that, Heikki (and Lewis) shouldn't have been there in the first place! I'm pretty disappointed that neither McLaren driver (as far as I'm aware) has come out and held their hands up, said they were wrong and apologised. McLaren are a certainty for constructors championship unless something really weird happens, but on current form the drivers title should be Kimi's. On your initial point, I don't think Lewis will have accepted that Heikki beat him fair and square, he will put it down mainly to bad luck in his pitstop - even Martin Whitmarsh says it was Lewis who would have been on the podium otherwise. "We warned our drivers to keep out of the way, so they were aware of faster cars approaching, but in fairness Heikki looked in his mirrors and saw a number of cars, some to the left and some to the right. He could see a BMW that had switched to the right and had to make an instant decision about whether or not it was on a quick lap. He decided it would be dangerous to cut across the track if the car behind had a possible closing speed of about 200km/h (125mph)." Looks like a perfectly good explanation to me and certainly not worth the exaggerated nonsense that has been poured forth in most of the blogs. I think it's easy to condemn after the event, once someone has mentioned the term "the racing line", but not so easy if you're in the situation yourself. As for Hamilton and the "fair and square" point, Lewis knows what happened that weekend and will have faced the fact that Heikki was quicker than he was on the day, I think, regardless of what Martin says. I have slaughtered both McLaren drivers for their behaviour on a few sites and I think the penalty was way too lenient but it is not as easy as you may think to stay completely off the racing line. At every corner the driver has to cross it twice unless he stays right on the inside and hugs the apex then moves to the inside of the track for the next corner in which case he crosses it once. Given Max's stupid rules the cars have to be raced as they have qualified so not unnaturally the drivers want to stay as close to the line as possible as this is where they have the least chance of any damage to their car. We all know that drivers have been known to deliberately pick up the marbles on their tyres at the end of the race to gain weight but these also get flicked on to the body work and no-one wants to carry any excess weight for a full race distance. Interesting point, Steven - and you're the first to make me think that there may have been more to the whole incident than meets the eye. I guess we'll never know, however. But the point about it being impossible to stay off the racing line throughout a lap is a good one too (and has much more to do with Gilles Villeneuve's fatal accident than does the McLarens staying on the racing line on a straight). It seems that the FIA are preparing a solution to this particular problem (yet another patch to a patch) and we shall see how effective it is. One simple solution would be to end the silliness of qualifying on race fuel, which would negate the need for drivers to cruise around on their in-lap, saving as much fuel as possible. I hear rumours that, instead of this, the FIA are planning to institute a 'maximum lap-time' to ensure that the speed of cars on in- and out-laps is not too slow. This, of course, opens the door to even more potential silly penalties when a team or driver attempts to push the envelope just a little too far in a bid to save that last drop of petrol. Something has to be done however as the onboard footage from Heidfeld's car was truly terrifying. Had one of the McLaren drivers actually moved off the racing line - as some have suggested they should - there would have been a shunt of simply aircraft style proportions. Clive is right to recall the accident that killed Gilles Villeneuve, where a similar misunderstanding occured - that is the last thing that we want to see again. Ah! Some vindication for me, I wrote on other sites that the Q3 slow driving situation was the DRIVER FAULT and was nearly run out of town but here ...... a couple level heads prevail. In previous times since the 3 part qualifying we used to hear the radio crackle "good lap mate, conserve fuel" and the drivers would return at a REASONABLE speed under light throttle. Why this extreme change to save a pint of fuel makes no sense and the DRIVERS should have known better. The scary incident was the McLaren who darted across in front of the on-coming Alonso. Another driver error. So.........for this, MadMax and his henchmen are no doubt working up 10 more pages of regs to handle this situation. Just get rid of the 'race fuel' requirement. It's better to erase one reg than to add ten more.